In what might seem like a staged collaboration, some of the largest U.S. retail chains are using a controversial retail strategy to motivate consumer spending in April and counteract the effects of an uncommonly early March Easter. That controversial retail strategy is called "store closings," which is the one retail event besides Black Friday that has an irresistible magnetic power to both draw shoppers through the front door and .pry their wallets wide open. Macy's, JCPenney, Sports Authority, Jos. A. Bank, Sears, and Kmart will all be conducting Going Out of Business Sales in April 2016, and hundreds of retail locations for these chains will close their brick-and-mortar retail store doors for the last time in April 2016. What follows in this gallery is an aggregated list of all Spring 2016 store closings, arranged according to store closing dates, with the earliest store closing date listed first. Kmart has been closing stores steadily since April of 2015, which is actually a sign of at least some stability in the discount chain. Unlike a chain such as Sports Authority, which needs to expedite stores quickly as part of its Chapter 11 bankruptcy, the Kmart store closings are seemingly happening as leases come up for renewal. Oddly the Kmart store closing strategy is a testament to the relative stability afforded to the chain by its parent company Sears Holdings. The key word in that sentence may be "relative." Kmart isn't the only major retail chain closing store locations in March. It just happens to be the chain that routinely steals the headlines. What follows is a list of all retail stores scheduled to close in March 2016. The list is arranged by store closing date, with the earliest date listed first. Final Store Closing Sale Date: "March"
FUN CLOSING FACT: This Kmart has been open since 1970 (46 years). It is he last Kmart in Volusia and Flagler counties in Florida. Closing in "end of March"
Final Store Closing Date: "Late March"
An early Easter is neither predictably good or bad for the U.S. retail industry, but one thing is for sure, when Easter falls in March (like it did in 2016), it's a long Spring Break for retailers before Mother's Day. And we're not talking about the life's-a-party kind of Spring Break. The major retailers that have chosen April for their final closing liquidation sales have created a way to transform an inordinately long spending drought between Easter and Mother's Day into a plausible excuse for consumers to keep spending. What follows is a list of all retail stores scheduled to close in April 2016. The list is arranged by store closing date, with the earliest date listed first. Final Store Closing Sale Day: "Mid-April"
Topeka, KSFinal Store Closing; "Mid-April"
This is the only Kmart in the area. Golden Corral, Sports Authority, Dunking Donuts, and Paradise Bakery & Cafe have recently left the Logan retailing area as well. Expected final sales day: "Mid April"
Walmart also closed its store in nearby Kimball in 2016. Was the first "big box" retailers in the county when it opened in October, 1981. Expected final store closing day: "Mid-April"
Store Closing Final Sale: "April"
Expected Liquidation Sale Ending: "April 2016"
Final Store Closing Sale Day "Late April"
Kohl's and Kmart are two of the largest retail chains that will be closing stores in May, June, and beyond in 2016, even though announcements about those store closings were made more than a year before some of the store closings will actually occur. 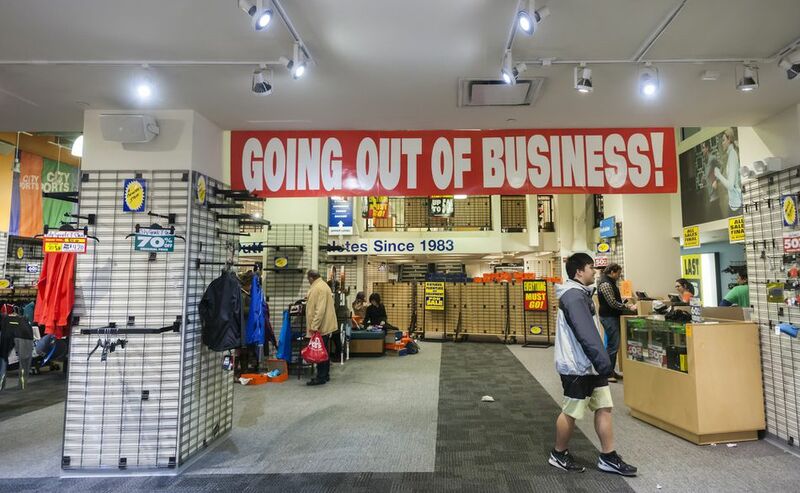 Other major retail chains like Sears have joined Kohl's and Kmart in their retail spring cleaning chores with Going out of Business sales of their own. Liquidation Sale began March 10th and final sales day will be "end of May"
Once closed, there will be only one Kmart location in operation in the Augusta area. Final Closing: "End of May"
1111 East Army Post Rd. Eighteen of the 19 Kohl's store closings scheduled for 2016 will be ending their Going Out of Business Sales and closing their store doors for the final time in June 2016. Other national retail chains like Staples and Hallmark continue their slow and steady downsizing efforts with final store closings in June. Additionally, the first of the Sports Authority bankruptcy Going Out of Business Sales will be ending in June, starting a busy Summer season of retail store closings throughout the U.S. Sports Authority shoppers have until June 28, 2016 to redeem gift cards. The June 2016 Store Closings list below is arranged according to the store closing dates, with the earliest June store closing date listing first. Final Store Closing Sale Date: "Early August"